Ten years ago, I wrote about the wider evolutionary shift happening in our times (McLean, 2003) and it seems that something new and unprecedented is continuing to be born in our world – we are not just in a new time but a new era. We are at a moment in history where quantum leaps are taking place spiritually, economically, socially and culturally. Life is evolving with extraordinary speed and energy as we are being challenged into new ways of thinking and relating as never before. It is a grass roots experience coming out of the reality of life as it is lived and experienced by people today. Over the past few decades, many people have become more psychologically and spiritually aware, and are awakening to self-consciousness — through gaining new understandings, and insights, into themselves and exploring the possibilities and potentialities of the transformation of new attitudes, values, views and perceptions in life. Many are returning to, and re-exploring, their Christian roots in different, exciting and challenging ways through engaging in new movements of religious reform and renewal and seeking to deepen their understanding, and practice, of Christian meditation and contemplative prayer. Many of these new currents are well documented and are known as emergent Christianity (McLaren, 2007), the spirituality revolution (Tacey, 2004), the great emergence (Tickle, 2008), emerging church (Schwartzentruber 2006), new monasticism (Karper, 2008), wisdom schooling (Bourgealt 2003) or the movement towards the contemplative, or unitive, mind (Rohr, 2003, 2009). Many of these new movements are emerging because more and more people are finding the ability to have a grateful foot in both camps — in tradition (mother church) along with a new consensus, and new support groups, that parallel, deepen, broaden, ground and personalize the traditional message. It is a new kind of reformation in which we don’t react, rebel or hate anything — it is more of ‘what are you in love with, what are you discovering in new, fresh ways’? Thomas Merton regarded the most urgent task for the Church in our modern times as this renewal of our lives. In his final talk before his death, Merton recounted a conversation he had had with a Tibetan lama who was faced with the decision of whether to leave his monastery in Tibet in order to save his life. The lama sought advice from the abbot whose response was, ‘From now on, Brother, everyone stands on his own feet’. Merton went on to say that, ‘You cannot rely on structures. The time for relying on structures has disappeared. They are good and they should help us and we should do the best we can with them. But they may be taken away and if everything is taken away, what do you do next?’ (Merton, 1974, p. 338) So, the most pressing issue for the Church is not the creation of new structures, but the deeper, more hidden work of ongoing conversion so that people can ‘stand on their own feet’. Merton believed the modern Christian’s vocation is not so much to convert others, but to seek ongoing conversion oneself so that one can see the reality of the world, in its full beauty and illusion, and others can see, and sense, the presence and love of Christ, living and radiating within us. The most radical transformation now is the emergence in human consciousness of a contemplative mind, which is a different kind of eye that perceives within a unitive mind, not a dualistic mind. Contemplative prayer is at the heart of the matter – which is the changing of our consciousness, our mental ‘software’ and allows us to enter into union with God, ourselves, others and the present moment. The contemplative mind is a new awareness, a new way of seeing and being trying to be born – in each of us, in society, in nations, and globally. Relationship and networking is an integral part of this new paradigm waiting to be born, the awareness of how we are totally interconnected and interdependent and how everything in the universe needs everything else, being all part of a whole, a sense of oneness altogether. This is a huge challenge to our concept of self-sufficiency and personal achievement, doing our own thing – yet the greater need is for communication, and openness; and the need to listen and to enter into dialogue without agenda. Here, the symbol is not a type of wheel made up of independent parts and separate functions, but a luminous web, or mandala, of relationship – a symbolic description of radiation of light and energy coming from within a centre, or whole, in which everything is connected and interrelated. In its deepest sense, what we are seeing is the death of dualism and the birth of mutuality. It is the breakdown of many historical and long accepted divisions – us/them, patriarchy/matriarchy, male/female, clergy/laity. Many of these categories do not sit easily with the modern consciousness — it is no longer a question of either/or but of both/and – where we can hold a balance of opposites; embrace paradox and be comfortable with differences and diversity. Here, experience is the key, and the point of convergence and learning is to trust our own experience and to respect that of others. It is dwelling in a sense of union, participating/living in, from the luminous web, meeting reality in its most fragile, vulnerable and immediate form. This is the place of our soul, St Teresa says, where ‘this fountainhead shines like the sun from the centre of our soul which never loses its radiance.’ (Interior Castle I, 2). This is the search for the immortal diamond of our true self, in Christ (Rohr, 2013) our diamond self, or diamond body, which ‘resembles a castle, formed of a single diamond, or very clear crystal, and containing many rooms, just as in heaven there are many mansions.’ (Interior Castle, 1, 1). The Christian contemplative, or mystical, tradition which flowered in fifteenth and sixteenth century Spain flowed powerfully and creatively through the lives and writings of the Carmelite saints, spiritual guides and reformers, St Teresa of Avila and St John of the Cross. In her Interior Castle, Teresa describes the Christian contemplative path of prayer as an ever-deepening interior journey of transformation of the soul towards, and in, the divine Love of Christ in our centre. Here, there is ongoing conscious surrender, at a radical level, to the action, activity and purposes of the Holy Spirit, so that we can no longer be thought of as acting from a centre that is essentially separated from God. This is the journey of contemplative prayer, which is growing, surrendering and emptying towards a state where what we are doing coincides, more or less, with what God is doing in us, or, in theological terms, the formation of our created selfhood in the likeness of Christ. Over nearly 430 years since St Teresa wrote this remarkable treatise within the walls of the Carmelite Convent in Toledo in 1577, her Interior Castle has become one of the most helpful, authentic and best-known spiritual guides of the Christian journey of contemplative prayer for many generations of pilgrims. I hope that my modern commentary on this text (McLean, 2003) helped to introduce, share and make it available to a wider audience. The importance and incredible impact, over many centuries, of her writings raises fascinating and intriguing questions. In her time, what was happening during the movements of religious reform and renewal, and who were some of the major spiritual writers that influenced, and guided, the young St Teresa and contributed to the great flowering, and reform, of the Carmelites? Most importantly, can we learn, and benefit from, today some equally important, but less well-known, writings on prayer of that time? I sincerely believe we can, and profoundly need to, in our post-modern, secular times of religious reform and renewal. This paper aims to introduce the Franciscan book, The Third Spiritual Alphabet, which was an important, and widely read, spiritual book of that time, which Teresa described as ‘her master’ for twenty years. Thus, this movement placed the heart and the oracion afectiva, or the importance of ‘unknowing’ as well as the affectivity of embodiment, at the centre of its concerns – ‘the mysticism of the recogimiento is one that pertains to the whole of the person: person and spirit, memory, will and understanding…it does not divide the body and the soul, interior or exterior’. Recogmiento is primarily a way of ‘contemplativa afectiva’ centred on love ‘sin pensar nada’ (‘without thinking of anything’), that is, without any necessary presenient or concomitant understanding. (ibid, 110). So, this kind of contemplation is the deepest meaning of the word prayer – which is moving to the level of pure consciousness where we are not thinking about anything in particular, and not focused on any one feeling, one idea or one object, but merely wide open to God and Mystery. Francisco De Osuna’s Third Spiritual Alphabet was one of the major texts of the recogimiento movement, and in the golden years of renaissance in Spain his writings were circulated and treasured by countless spiritual seekers — most famously, by the young Teresa of Avila. He was one of the last great teachers of the contemplative tradition that had been systematically taught in the monasteries for centuries, starting with the desert mothers and fathers. His Third Spiritual Alphabet enjoyed great popularity in the 16th century and was published in several editions. This alphabet describes in detail the complex psychological processes of recollection and offers advice and signs of progress along the way. His language is often warm and simple, using original and often charming images from ordinary life. Osuna’s writings were a significant precursor of, and major influence on St Teresa of Avila and St John of the Cross. St Teresa spoke clearly of her reliance on The Third Spiritual Alphabet as a guide for the practice of prayer from an early stage of her life as a religious. She was given the book to read by an uncle sympathetic to her need — it was a timely gift and Teresa spoke of how she began to follow the path of recollection. She describes Osuna as ‘her master’ in prayer for twenty years and he was, in fact, her spiritual master beyond the grave. He spoke to her in a critical period of her spiritual formation through his writings – particularly the Third Spiritual Alphabet. It was also her guide through the intensities of her religious experience and at a later stage a resource for her teaching others the practice of recollection. Scholars also view in the writings of Osuna a vital intermediary in the development of Spanish Mysticism through whom the ancient science of love was carried through to both Saint Teresa and Saint John of the Cross. Teresa’s own life changing encounter with Osuna presents us with an intriguing possibility. Can this great teacher also be a living presence and wise guide today for 21st century Christian seekers – and contribute to the modern religious renewal and reform that is well underway in our own time? He lived during the early period of sixteenth-century mysticism in Spain which was characterized by an extraordinary recovery, and assimilation of, teachings from the ascetic and contemplative writers from the early desert and patristic tradition. It was a period of religious renewal and reform that touched the lives not only of priests, friars and nuns, but also lay people in Spain – a time very similar to our own time today. Can we also meet Osuna, through his writings, as a master teacher in a traditional school that embraced, and passed on, a comprehensive body of knowledge and practice about contemplative prayer and spiritual transformation? Reading, studying and pondering on The Third Spiritual Alphabet is an encounter with a mature elder, who was deeply immersed in biblical wisdom literature, as well as gifted with great wisdom in the journey of Christian prayer. Alongside St Teresa of Avila and St John of the Cross, he constantly points beyond himself to Jesus as the master teacher of wisdom. He was born about 1492 to a family serving under the powerful patronage of the counts of Urena, and named after his birthplace, the town Osuna in southern Spain in the province of Seville. As an Observant, Francisco belonged to the main branch of the Franciscan rule and lived a communal life passionately dedicated to prayer and meditation, and the practice of poverty and charity. He was a prolific writer on prayer, and formulated maxims as memorable and pithy guides for meditation which he arranged alphabetically. His six spiritual Alphabets created the structure for his series of treatises, each alphabet following a different spiritual theme — the passion, prayer and ascetic practices and most notably, the practice of recollection. His spirituality was eclectic, combining elements of Franciscan spirituality, the affective way of the heart, with the Augustinian philosophy of love. The Augustine way stressed that oneness between God and humanity is the essential starting point for spiritual life and that this communion or friendship is possible for all people. In his synthesis, Francisco saw mystical theology and mystical experience as a harmony of love and understanding, of the will and the intellect. He anticipated the Carmelite theology with its emphasis on going beyond dependence on sensory awareness and the inner work of emptying the heart to become free from limiting compulsions and over attachments. Reading The Third Alphabet can be a way of aligning ourselves with a long lineage of wisdom teachers, in the tradition of theologia mystica, where we encounter the particular vocabulary of ‘the heart’ and of ‘recollection’. He constantly refers to ‘the heart’ as the source of life and the essential joining place where all of reality is collected and gathered up in God – this is knowing at depth and in our ‘centre’, knowing that comes from loving, embodied knowing, and a ‘dark’ kind of inner knowing that is beyond the grasp of the ordinary workings of the intellect. Heart knowing therefore – or seeing reality with the ‘eye of the heart’ – is spiritual knowing that comes when awareness is brought into and grounded in that place. Osuna also recovers the rich meanings to the word recollection – not only the ordinary sense of being self-contained, or of remembering, but a word weighted with theological meaning. Recollection in this sense refers to the cosmic spiritual movement where the whole of reality, the whole community, the whole person is constantly being gathered and collected up in God. Spiritual knowing comes from that place of recollection – and is the way of participating in that spiritual recollection. Osuna sees the practice of recollection as participating in the way of prayer exercised and taught by Jesus. He acknowledges the other forms of spiritual exercises common in his time – acts of penitence, meditations on the passion, acts of mercy, pilgrimages, fasting amongst them. However he goes on to say — ‘if you wish to advance further and imitate loftier things, our letter advises you to frequent recollection and become an expert in it, thus emulating Our Lord, who used to go out into the desert where, apart and recollected, he could more secretly and spiritually pray in concealment to his and our heavenly Father.’ (T6:1) The exercise of recollection is a practice of renouncing — what Osuna sometimes calls the ‘little no’ — superfluous cares and useless reflections that fragments and exiles us, so as to be restored to our true self. The practice of recollection is also to be understood as a way of participating in the radical self – giving and self-emptying that is at the heart of the witness accounts of Jesus teaching and life. Training in recollection is training in kenosis — a particular kind of training in willingness to give over self-limited life to join in the cosmic exchange of life that Jesus lives out. As spiritual guide, it helps to appreciate that the process of Osuna’s reading of scripture follows the patterns and flow of the monastic practice of ‘lectio divina’. In the spirit of this well-established practice of sacred reading, he constantly turns to the scriptures for wisdom stories. He meditates on them imaginatively, entering into them to see what is being shown in them about growth and transformation through symbol and analogy, allowing a deeper movement to a more subtle level of contemplation. We can also be on the alert for how Osuna uses symbols and images. In an intentional way, he often uses strange and contrary images to startle us awake to pay attention to our inner experience. His distinctive approach is the traditional way he uses pithy wisdom sayings as the focus for each individual treatise, which provides the structure of the whole alphabet. There are twenty three in all. Each saying is a distillation of a complex truth and in each of the twenty three treatises he meditates on their meaning – much of the time in the spirit of lectio divina. Thus, theologia mystica is pursued not through learning, books and teachers, and Osuna emphasizes that it is not possible to ‘teach’ this theology — ‘I do not presume to teach it in the alphabet, nor can any mortal can do so, for Christ reserves to himself the ministry of secretly teaching the hearts where that theology lives hidden like a divine science’. (T6.2) There are various other names for this tradition of theologia mystica, which he highlights. It is called the path, or tradition, of Wisdom because – ‘it is delectable knowing. Such wisdom, according to Saint Paul, is found only among the perfect, for the imperfect are not given to eat of such sublime teaching. It is called wisdom because it allows us to know how God tastes.’ (T6.2). Osuna clearly states that the whole subject of his Third Spiritual Alphabet, which had such a powerful and decisive effect on St Teresa, is a continuation of the ancient lineage of Christian theologia mystica — ‘because the good teacher Jesus imparts it in the secret hiding place of the heart…as our principal teacher, he kept for himself this principal doctrine, for among all disciplines theology is the queen and lady of learning’. (T6:2) Thus, the tradition of theologia mystica is essentially describing knowledge of God that imparted ‘in the secret hiding place of the heart’ and is obscure to the human mind or intellect. In the First Treatise, Osuna introduces his first wise, pithy saying: ‘Which speaks of the constant vigilance we need to strive in purity of spirit to attain to God, saying; May the person and spirit always walk together.’ Right from the start he gives us the foundation principle for recollection, which is the harmony that comes from ‘walking together’. This walking together is a symbol that speaks of inner harmony of the whole person while seeking to ‘attain to’ or know God, which requires a certain quality of vigilance and certain kind of striving. Osuna is like a visionary architect who sketches the finished structure of the ‘house’ of recollection that is being built in the soul — whose end vision is to directly know communion with God. The path that leads there is the way of recollection in the heart, and he encourages clarity of aim and purpose. He also encourages clarity about what can, and needs to be learned, and what cannot be learned. What is in our capacity to learn is how to bring our whole selves to prayer or as he puts it, to approach God with our powers of soul united. This recollection, this gathering and collecting up of all the powers of our faculties is, in fact, what we need teaching about – in the twenty first century every bit as much as in the fifteenth century. Osuna’s understanding of recollection is that it is a movement, a gathering into a communion or friendship with God, which is available to all, in the here and now, before death. His way of recollection presents us with the perennial paradox. On the one hand to seek to know God in friendship, which asks of us a wholehearted and single-minded purposefulness. Yet it is also true that the whole relationship is entirely beyond our efforts to create or make. Spiritual friendship is not an outcome or product of teaching about recollection, but is the all-encompassing reality into which everything is being gathered and collected up. What can, and needs to, be learned is what helps, and what hinders, the training of our hearts and minds to recognise and participate in this reality of spiritual friendship. The inner work and teaching of recollection is in how all our human faculties can be drawn in to work together in harmony in a permanent way. Osuna first evokes the experience of inner harmony by showing what happens in the soul when the mind is not in harmony. Using various images, he shows us the impact of thinking habits that are out of step or working against recollection. Firstly, there is a lack of harmony when thinking is constantly restless and unsettled. Harmony is also missing when the mind is over-preoccupied, which, spiritually speaking, means we are not able to receive the gifts of grace and wisdom. Osuna’s wise saying here is’ The heart of a fool is like a broken vessel which cannot hold all wisdom’ (Ecc 21;17). The root cause of the dissipated and divided mind is the disordered relation to the four principal passions of joy, sadness, hope, and fear. When emotional energies overwhelm and dissipate the energies of the heart, harmonious recollection of mind is impossible. According to Osuna’s psychology of the heart, our inner attitudes and relationship with our emotional experience is critical. The healing work of harmony is to free us from clinging, manipulation and hidden agendas of our emotionally charged thoughts and impulses. The way that this can happen is through reflecting from the wise perspective of justice, prudence, fortitude and patience in relation to our inner experience of passions. He sees such reflection, and understanding, as the key to a new and harmonious relationship with our thoughts and feelings, which can become psychological and spiritual values in our ongoing self-reflection and our prayer. Osuna is introducing the kind of healing work that needs to be done through prayerful self-reflection, which can only happen within the paradigm of friendship with God and the soul who ‘walk together’. From his wisdom perspective, this means being free from being driven by compulsive desires from what cannot ultimately satisfy us and what keeps us in endless cycles of seeking satisfaction. In our experience of loss, we can learn how to act inwardly with prudence, or wise caution, carefully discerning what is inevitably transient, and letting it go so that grief does not have to flood our minds. In our desires and ambitions, we can learn to temper our expectations so we are not controlled by them, nor are our energies pulled and dissipated in too many directions. In summary, the overall effect of interior justice, prudence, temperance, fortitude is not to deny or ignore feelings but ultimately to experience them more freely, truly and deeply from the point of unity within the heart. In his meditation on the need and remedy for harmony, Osuna introduces the essence of the inner strategies and spiritual practices in the First Treatise, which are needed to be exercised in prayer and meditation. We need to learn to enter into ourselves by bringing our mind into the heart, which, he says, is like the vagabond, fugitive mind coming home to rest. We need to learn to sustain alert and awake wholehearted attention — like a purposeful and vigilant fisherman or miner – as well as learning to anchor or secure the mind in the heart through learning detachment from our own thinking. Training our mind to be receptive, alongside loving engagement with our emotional experience by exercising the traditional virtues of justice, prudence, fortitude and patience is also important, so that inner freedom can grow ‘so that the soul may be freed to devote itself to God‘ (T1:2). The second meditation picks up another strand of experience — the harmonious working together of sensuality and the reasoning conscience. We tend to speak of conscience as an inner voice that, if we listen to it, guides our personal relationships and outer social behavior. Osuna also sees the inner voice of conscience, and responding to it, as essential in how we know, and how we love, in our inner experience. In his description of the workings of this inner conscience, he sees the intellectual faculty of reason fulfilling its spiritual purpose – which is an interior capacity to see, and recognize, the subtle spiritual movements in the heart. In this inner reasoning of the conscience, we can recognize, as well as give voice to the spiritual promptings in our heart. When we act on these promptings – either in outer actions or inner ones – harmony can be restored. Where we are out of touch, or step, with a prompting then we can become more troubled, as we become out of step with our true self. What we need to train ourselves in, says Osuna, is in the speed of our response. What then is the inner thrust of the work ‘recollection’? Osuna says that recollection is a word that includes, and embraces within it, many implicit interior movements. In the Sixth Treatise, he outlines ten interrelated spiritual movements in the soul, or ten interior acts of prayer, that is possible to consciously practice in order to ‘train ourselves’. In this treatise, he aims to bring greater clarity to how we can direct our awareness and intention in the subtle spiritual movements of joining, reconciling, gathering and collecting which is already going on within us, and gives a general overview or a blueprint of whole movement of transformation that helps us recognise where we are and what may be changing within us. The movements are not so much fixed stages to be passed through but more like a gradually increasing intensity of the divine gathering within, and in this complex dance the movements are progressive, yet simultaneous and continuous. His descriptions are about showing the inner attitudes and purpose of spiritual exercise of recollection, using whatever specific practices are most useful for this purpose which are only learned through what, he calls, ‘the book of experience’. The first movement of gathering is in the reconciling relationship between people: ‘it gathers together those who practice it and, by erasing all dissension and discord, makes them of one heart and love.’ (T6:3) The prayer of recollection is not conducted in isolation – primarily it is a shared experience. Spiritual recognition is not based on the idea of external criteria of belonging, but is experienced as something inward, intensely visceral and strengthening — as a profound stirring, a joyful astonishment, a sense of coming home, a oneness. The second movement of recollection is a 'drawing in' of awareness from an exterior orientation. The exterior person is gathered within himself – when the self is constantly over-preoccupied with outer roles and concerns the soul is very vulnerable. The turning inwards is not an avoidance of the world but is about changing the terms of engagement with outer roles and responsibilities. It is about creating a free and realistic relationship with the world and nourishment from spiritual resources within us. A practical aspect of this movement is the ability to ‘gather up’ our concerns to approach God more intimately. What the art of ‘gathering up concerns’ may look like is to take a daily inventory of our concerns – learning to mentally bracket them with the express purpose of tuning into spiritual presence in the heart. This requires skillful and welcoming, but dispassionate, attention to whatever our concerns — but it ensures that we remain consciously connected with the spiritual source of life and nourishment in the heart. The outer orientation towards solitude is mirrored inwardly. Osuna gives three helpful verbs: to retreat, to go out, and to return. First, there is the training to let our attention retreat from the noise of ordinary perception, in order to begin to acquire a taste for what is secret and unknown. Secondly, we may need to ‘go out’ and bring our full and free attention to the necessary tasks in daily life. Then, there is the training to promptly and freely return our attention to the heart – which can develop into a growing habit of constantly returning our awareness within begins to build a growing inner stability, and capacity to stay connected to, the spiritual resources within us. The fifth movement of recollection quietens or calms sense. What is being noticed here is a change in appetite — 'Recollected people also look away promptly and humble their eyes, taking no pleasure in seeing anything, for their only wish is to see God in their hearts.' (T6:4) What was attractive and stimulating before now loses appeal and, in fact, may seem wearisome. This is a deepening of detachment – not only detachment from what occupies our hearts and minds but a changing in the very patterns of knowing and wanting. Osuna speaks a great deal of the art of guarding the heart in the Fourth Treatise – where this deeper knowing and deeper spiritual desires are given boundaries to protect them. The structured practice of silent meditation offers an effective way of training us to do this. In silence, we look beyond our thoughts to seek spiritual presence within the heart. In the sixth movement of recollection our physical energies are gathered into spiritual life. What Osuna describes is a gathering in of the energies of the body, so they become ‘calmed, tempered, and corrected’. The powerful energies of instincts – sexual, aggressive and protective are being gradually gathered up and harnessed in the work of recollection. The role of the body in prayer lies in how these energies intensify recollection — rather than in expressing yourself in nonverbal physical gestures. Where we consciously create a partnership with the body in a walking meditation, in chanting, in prayer of the breath, or certain postures and gesture that gather energy we will be close to Osuna’s meaning here. In the seventh movement there is a gathering up of the strength of the virtues in those that ‘give themselves over to devotion’ , which holds all the meaning of self emptying and kenotic surrendering to the presence of God in the heart. This emptiness is paradoxically a fullness of virtue – that effortlessly and spontaneously enters this ‘house’ of the wisdom in the soul being built. To the extent that emptying is an art, Osuna uses the phrase ‘self-forgetting’ or ‘pouring out the self’ to describe it. The virtues and graces that fills the soul in emptiness can only be received and Osuna eloquently describes the manner of receiving — without analysis and without giving into fear. We are, in fact, training ourselves in the art of radical gratitude, which is the art of giving wholehearted loving attention to what is received, sinking our awareness in it, relishing it and feeding it. Recollection is a movement of realising and fulfilling the true spiritual identity of the self. The devotion of recollection ‘is to gather man’s sense in his heart interior, where the glory of the king’s daughter’ is found. The radical surrender of needing to know God through sense, and to be in control of prayer, sinks us into the darkness of the interior of the heart, which is creative and not destructive. Here Osuna uses his image of a hedgehog — ‘compare the recollected person with the hedgehog who contracts his body and retreats into himself without concern for anything outside. Like a very heavy stone concealing the hedgehog, this devotion.... is refuge for the recollected person who has everything he needs within and does not think ill of those without who may inflict harm on him. ’ (T6:4) The art and exercise of recollection here is surely living over time within the tension of these deep paradoxes of the God experience – experiencing simultaneously the abyss of the heart’s interior and the safe grounding of the hedgehog, or experiencing both the majesty of the soul and its utter hedgehog-like humility. The ninth moment of recollection transforms the powers of the soul in the heart — namely the will, intellect and memory. Here these inner faculties are transfigured 'in the souls highest part where the image of God is imprinted’ and operate in a way that transcends their usual way of functioning. This is traditionally called their perfection or completion. The prayer appropriate for this movement is what Osuna calls ‘seeking God in groaning’ – an inarticulate movement of the will towards God. Joining God in the Soul and the Soul in God. Recollection is complete in the dynamic centre of union in the heart which unites 'God with the soul and the soul with God'. Here the whole personality is illuminated and radiates love and truth from this centre outwards — in the way that transparent crystal refracts light. From this dynamic centre (or height) the wholly recollected person is fully participating in the powerful acts of God within — the 'mighty deeds' of contemplation that take place in the soul. His spiritual wisdom is that the greater the gifts we have received, the greater needs to be our gratitude, thankfulness and obligation to share, and give back, all that we have received towards others and the world. From the perspective of gratitude, everything we have been given are gifts of grace and goodness by God ‘in trust’ so to speak, as potentialities and possibilities — which we can’t really possess or own as ‘mine’ or ‘ours’, as the great rivers of grace and goodness are the expression of the universal flow of truth, beauty and goodness into life. So, our ever deepening gratitude, thankfulness, and emptying of ‘ourselves’ is the true and real ‘fuel’ or ‘energy’ that keeps our creative essence alive and continually growing. The transformative wisdom Osuna is highlighting is that the growth of radical gratitude in our lives is the key to our spiritual growth, and guides, helps and brings into manifestation what would otherwise remain unformed and unborn in life. Whatever this spark of consciousness is at the heart of our being, radical gratitude is the key to bringing it to birth, form and fullness in our lives. If we don’t, it isn’t just a failure to germinate; the thing can turn on us and destroy us from within. So, when we give thanks, the waters of gratitude continue to flow and are able to return to their Source, which means that radical gratitude continually helps us disidentify, detach, and stay non-possessive in regard to all the gifts that are bestowed on us, both of joy and suffering — indeed all of the fruits of our potentialities and possibilities. The key here, Osuna says, is the ‘seeing’ of the gifts that are alive within us, of the movements of grace that are continually being given. If we don’t ‘see’, or ‘recognise’ the movements of the flowing waters, or grace, through gratitude, it will begin to dry up. This new seeing, recognition and aliveness then feeds more and more of the desire for God, the ‘soaring grandly like the living waters’ , which continually flow and course back, to and fro, from the primal source. The key to this continual seeing and recognition is radical gratitude. The consequences of hoarding our gifts and potentialities and not giving thanks to God is like being — ‘a bad river that fails to return to the sea because its waters are stopped up in pools and marshes where they grow stale and putrid, unfit for fish, swarming with dirty, poisonous things. If you bottle up God’s gifts within yourself and are ungratefully possessive or think yourself worthy of them, they will die, drained of their divine approval that is the ultimate, supreme life of all things.’ (T2:1) In our modern psychological understanding, he is referring to feelings, attitudes of jealously, envy, resentment, bitterness, rivalry, grudging, malice, and enmity, which all flourish when there is little, or no, gratitude. In the Third Treatise, he restates a familiar saying in a fresh way — ‘How the soul is to be with God: blind, deaf, dumb, and always meek.’ He places this seemingly odd disabled way of perceiving God within the school of teaching about apophatic or imageless prayer. His experience-based language of ‘not seeing’, of ‘not hearing’, ‘not speaking’ captures subtle and precise dynamics of silent prayer that create the right milieu in the soul for spiritual perception to grow. Also, voluntarily becoming ‘blind, deaf and dumb’ in silent prayer implies certain inner acts in our awareness – that is, practices that involve a certain inner blindfolding, plugging up the ears, or stopping up speech. Osuna affirms the experience of prayer that uses reason and imagination in order to clarify a distinction between this and the imageless way of prayer that he wants to reflect on. Our capacity for reasoning about, and imagining, God is to meditate using the natural ‘light’ of reason. In this treatise, whilst affirming the role of reason and thought to gather up meaning and insight from experience, Osuna points out the limitations. First of all, the light of reason is ‘a weaker light’ producing less understanding of God and in direct religious experience can become overwhelmed and is not able to function. It is like looking at the sun and being blinded by the brightness. In addition, the drive to understand about spiritual experience frequently gets in the way of receiving spiritual knowing. And most of all he warns, interior reflection in itself becomes unhealthy when the desire to understand distorts into a presumption of being able to do so! The problems here are not in the desire to understand per se, but in attitudes of drivenness and arrogance. Given these inadequacies and common difficulties in prayer, Osuna suggests that ‘(God) wishes us to embrace him and his things with the arms and wings of heart’. (T3:2) He returns to his theme of heart knowledge, which is not objective understanding but an embracing kind of knowing. So, this disability language is really a way of speaking about what he calls a safer and easier way of prayer, and he is encouraging practices of silent prayer that develop the necessary spiritual attitudes of gratitude and meekness that help us avoid the dangers and limitations. This safer and easier way is to contemplate the source of spirit directly in the heart in such a way that our capacity for knowing is very gradually increased and adapted. He describes this sure progress as a transformation from being like easily blinded bats or owls, or like gnats getting burned when they fly too close to the light of a candle — into eagles. It is a protective turning a deaf ear to the push and pull of emotionally charged thoughts. This purposeful deafness guards spiritual perception from being disturbed by thoughts that have, so to speak, a more gross vibration and frequency. In the practice of silent meditation, this turning a deaf ear is unlearning our response to the demands of thoughts simply because we are learning to tune into more subtle frequencies of spiritual communication. Osuna brings in his third word from his experience – dumb. It is closely related to deafness, but brings in another strand of meaning — ‘The third word says that we also should be dumb within, speaking no words, however soft.’ This sense of muteness in prayer is both paradoxical and very powerful. Osuna sees it as a silent beseeching that in fact communicates our spiritual desire more clearly than words can, and that dumbness in silence is something that precipitates real change. Dumbness has, for him, a quality of passivity where that part of us that wants to take initiative in prayer, that wants to express itself in prayer becomes inactive. It is learning to ‘wait in silence’ which Osuna insists is the greatest good we can do. So paradoxically, the dumb surrender of the need to initiate and willingness to relinquish control of the experience of silence is key to discovering a radical freedom. The fourth and last word that Osuna meditates on is the word ‘meek’. The word is not only a fundamental spiritual attitude in silence but the fruit of the blind, deaf and dumb waiting that can be seen in daily life. Osuna’s description of the qualities of meekness clearly bears all the weight of meaning of the wisdom saying of Jesus – ‘Blessed are the meek, for they will inherit the earth’ (Matt 5:5). He lays out a rich and detailed vision of those who come into the full inheritance of what it is like to be both fully human and spiritually alive – ‘Meekness is a quality of repose in the generous soul and describes a person not easily upset. The meek are moderate and temperate in everything: their wrath tamed, they are not impetuous, but calm. They are sweet and mild, not harsh, no bitter word galling their mouths, good nature, in no way malicious, rancorous, or suspicious, they transform everything into goodness and kindness… filled with forgiveness and patience, they are generous by nature and share all they have.’ (T3:4) Meekness in this sense is essentially and powerfully creative. There is nothing weak about meekness – it has qualities of expanding, regenerating, conserving, protecting and intensifying. In being free from the demands of the smaller self, it multiplies and magnifies the larger vision of the whole self-recollected and gathered up in God. The wise saying in Treatise Four speaks about ‘Safeguarding the Heart: Empty Your Heart and Pour Out All Created Things’. The main spiritual counsel of this treatise is sharing the spiritual wisdom of how to safeguard our heart, in order to protect, and safely contain, the emptiness within. He uses wisdom from Proverbs 4;23, ‘Guard your heart with all vigilance, for all life issues forth from it’ as the basis of his teaching. He writes how safeguarding the heart is vitally important in the spiritual life, and gives a long commentary on this passage, using the familiar castle symbol to get his message across. It is interesting that he uses this specific symbol so prominently — as St Teresa’s spiritual director, Osuna perhaps influenced her to use the same symbol in The Interior Castle. He describes the three powers of the soul which must be guarded if the heart is to be safe on all sides — the first gate of the heart is the rational power and the faculty of reason (our mind) with which it is governed, the second gate of the heart is our will and intention, or the irascible power (or passion, zeal) that defends it and the third gate of the heart is the power of desire and memory that moves us to act. For those who wish to follow the path of recollection and wisdom, and guard their hearts, he recommends that ‘watchmen’ should be set outside the castle of the heart to protect against the three things that the heart fears most — in the first gate (mind), deceit is protected against by thoughtful reason, in the second gate (will and intention), fear is protected against by the fire of divine love burning within, and in the third gate (memory and desire), hunger is protected against by the appetite and desire for celestial things. So, the first gate of the heart is the gate of our faculty of reason and rationality, and to protect ourselves against deceit, he recommends exercising thoughtful reason, i.e. not allowing anything to enter the heart that is not thoughtfully examined. He is clearly following in the early Christian tradition of the desert fathers and mothers, who advised that the best way to be free from disturbing and impassioned thoughts is to analyse and reflect on them, in order to become conscious of what is driving them. Deep reflection on our intentions, both known and unknown, can bring us to the root of disturbing conflicts and anxieties, which need to be resolved, and healed, before we are fully able to experience the depth of silence, surrender and emptiness that we are seeking. The second gate of our heart is the gate of our will, passions or intentionality. Osuna, again, is following the ancient understanding of the structure of our soul from the desert tradition. One of the key exponents of this tradition was one of the early desert fathers, Evagrius of Pontus (345-399AD) who divided the passions of the soul into two parts – those that draw us towards things that are not God, which are known as the concupisible desires of greed, lust and jealousy and those that cause us to push away things of God – known as the irascible desires of anger, sadness and sloth, with pride being the root of our turning away from God. It is important to clarify that all of our human passions or desires are neither good nor bad in themselves. From a spiritual perspective, they become good when directed towards God, and bad when directed away from God, so the goal of the spiritual journey is the reordering or redirecting of our passions back towards God. In Osuna’s wisdom commentary in this Fourth Treatise, he is trying to lead us to understand how important it is to 'disencumber our hearts and drain them so everything created is emptied out and thrown away in order for the Lord alone to dwell there…devote yourself to God, you will rest in him; enter into the privacy of your soul, casting our everything and leaving God alone. '(T4:5) When our minds are at rest, when ‘the trembling, restless hand of thought is steadied’, the peace of God is able to guard our heart and mind for the quiet, stillness and silence of the Lord to lift us above our senses and faculties to greater things. When our hearts cease to reflect on creation and our intelligence is occupied solely in God, neither admitting nor giving room to anything other than God, then the heart is truly guarded with all vigilance for God alone, and God issues from it in silence. In Treatise Seven, Osuna addresses the common and distressing experience of those whose inner life deepens and intensifies, yet find that the growing peace of recollection is disturbed by involuntary, destructive thoughts that rise up unwanted from the unconscious. He is returning here to an earlier theme of the need to keep a vigilant guard of the heart — but speaks here of a more intense form of conflict. He uses the traditional metaphor of spiritual warfare to explain what is happening within the soul. He uses the metaphor of military warfare in a positive, pastoral way — not to frighten but to encourage a canny alertness and detached regard in relation to thoughts. For Osuna, thoughts that destroy the peace of recollection in God are the work of evil. These ‘thoughts’ are so invasive, so subtle, so deceptive that he attributes them to the devil — the ‘clever warrior’ and the ‘skilled soldier.’(T7.1) Contemporary readers may have difficulty with his world view and description of demonic and angelic activity within the soul. One may speak of these destructive forces in a psychological way — as the negative, unconscious energies of our shadow, which St Teresa described, in symbolic terminology, in the second mansion as our interior ‘lizards and snakes’. The first step to responding to the inner conflicts in our soul is to understand how the 'enemy within' works. Osuna describes the various strategies of these destructive forces — for it is indirectly, through the impact of these demonic, or destructive, strategies on our inner life that alerts us to their presence. Hostile psychological patterns can be experienced as invasive thoughts that disempower and control mind and will, contagious thoughts that affect the whole person, deceptive thoughts that appear to be ‘good’ or repetitive destructive thoughts at ever deeper levels. Various Powers Working Together for the Good of the Whole — There are different kinds of angels that work in different parts of the soul. Seraphim 'enflame desire' — acting in the concupiscent aspect of the soul. The cherubim act on the power to know — the power of the intellect. Where the spiritual power of angels is concentrated or established — in ‘thrones’ — there is realising of truth and desire in the soul. (T7:3).The angelic powers cooperate with each other to achieve their purposes. Osuna gives some specific examples of the kind of religious thoughts that ‘tempt’ and ‘embattle’ us. (T7.4 - 5) He refers back to the inner map of the various movements deepening the peace of recollection described in the Sixth Treatise to show how these destructive thoughts can divert, block or dissipate recollection. Osuna’s overall intention here is to encourage and give hope — thoughts that tempt away from recollection are not preventable, but can be, if recognised, graced opportunities. Recognition but Not Consenting to Thoughts To consent or surrender to thoughts implies a belief in their truth and identification with them — 'The one thing that can give us confidence in this war of lewd fantasies and various disconcerting thoughts is the knowledge that we do not consent to it. ....All dreams and fantastic thoughts blasted at us by the devil do him no good unless we consider ourselves defeated… thus we must never surrender…. for so long as there remains in us one ounce of discontent and hatred against his tactic, victory is not his.’ (T 7:8) The effort here is to learn to watch all our thoughts without self-identifying. Thoughts Received but Not Retained The effort here is to learn to not hold thoughts in our regard — not hold, or attach to, any thoughts in our awareness so we keep seeing them, but also constantly letting them go – ‘The second strategy that can gain victory over prideful Lucifer is scorn and disregard for the thoughts he causes in us. The more we disparage these thoughts, the more easily they are renounced. Truly these thoughts do not harm us but help purge our souls, and we ought to act, therefore, like the man who was walking down the street when the wind blew a huge cloud of dust in his face so that he could not see where he was going. Rather than be concerned, he simply shut his eyes and continued on.’ (T 7:8). He emphasizes how important it is ‘to be at home within ourselves’ (meaning increasing recollection, self-knowledge and self-awareness) in order to welcome the Lord when he comes — ‘we know he will come; only the time is not known…the Lord does not wish to apprise us of the exact time of His arrival, for we are to be ready to welcome Him at whatever hour and time. The Lord says we are to wait for His coming, when He will console us with His love and reveal Himself to our hearts.’(T9:1). So, Osuna is encouraging us to be continually recollected from within, not being diverted by vain thoughts, painful distractions and worldly affairs, but exercising gentle discipline, so that all our distractions in prayer can serve as a warning and caution to be always returning to the sacred enclosure of our heart. We need a lot of encouragement to, very patiently, wait in the enclosure of our heart, in order to be awake and attentive to the moments when He will come — to be able greet Him wholeheartedly when He enters our heart. Therefore, we should open the doors of our hearts and give lodging to Him, and Him alone, closing off ourselves and recollecting ourselves so as to be more prepared for His coming into our hearts. Transformation of the Memory – Constantly Remembering God In Treatise Eleven, he writes about how our faculty of memory can be distorted and corrupted (T11:1) by remembering teachings in ways that distort truth, obsessively remembering what needs to, or has been, let go of, continually remembering hurts that then stirs vengeance, hidden attachments to the memories of pleasure/security/esteem or a continual preoccupation with evil. He says the remedy to how the faculty of memory is co-opted for harm is a spiritual one — it is a self-forgetfulness that flows out of experience of the inner beauty and desirability of the soul to God, a self-forgetfulness that comes of not only remembering God, but that we are remembered by God. The higher kind of memory of God which Osuna is advising ‘causes all interior and exterior things of man to function because it provides them a simple operation that is compatible with recollection, an operation that consists of representing God in his pure essence. This memory is based on recollection and is infused into man, seemingly raising him from death to life and vitalizing his innermost being and heart and eyes so that he lives for naught else but God because his memory is of naught else but God….in a lofty way, we remember God as unlimited being, immeasurable kindness, beginning without beginning, end without end, fullness that leaves nothing empty, invincible power, knowing that ignores nothing.' (T11:3). This paper is attempting to highlight the relevance, importance and significance of the sixteenth century flowering of this tradition for today, as I believe that we are in the midst of another great flowering of theologia mystica in our own time. The unprecedented spiritual longing and emergency of our own times is fueling an overwhelming need for this depth dimension, and ancient tradition, of our Christian journey towards ‘union with Christ’ to become more widely known, understood, practiced and lived. There is a wider evolutionary shift happening in our times, and something new and unprecedented is being born in our world today – we are not only in a new time, but a new era. ‘I believe that we are living in a time of great grace, and I believe that future generations will look back on our day and regret that they were not alive now. That’s not a view commonly held. The church that most of us have known certainly seems to be dying, if we call ‘church’ our structures. These carefully constructed structures are crumbling and will probably, in the lifetime of many of us here, collapse under their own weight. God is, I believe, doing for us something we would never do for ourselves. There is too much security in our structures, too much safety from real questions in our denominational certainties, that we would never begin to ask if left to ourselves. It is too early to see the beautiful thing that God is building. We are perhaps in the darkness before dawn, but God is creating a new way of being church. And we have the opportunity, are graced with the possibility, of sowing the seeds of that new church – even though we may not live to see them come to full flower. Now it ill behoves me as a Carmelite, on such a great Carmelite day, to quote a Jesuit! But Karl Rahner once famously said that the Christian of the future will be a contemplative or not at all. So, in our modern times, we all need the deepening experience of hope, faith and love to be able to trust, and abide, in the living waters and the burning fires of Divine Love, and rest in the continual and persistent awareness of God's presence at all times, in all places, uninterrupted by life and activity. The lives, writings and spiritual direction of all the great Spanish Mystics, Francisco de Osuna, St Teresa of Avila and St John of the Cross show that it is possible, and indeed, is every person's spiritual birthright to be called into the deeper contemplative life, into unceasing prayer, into 'union with God', as the life of Jesus Christ and all of His saints throughout the centuries have shown and testified. Bourgealt, Cynthia. The Wisdom Way of Knowing – Reclaiming an Ancient Tradition to Awaken the Heart, John Wiley and Sons, 2003. De Osuna, Francisco. The Third Spiritual Alphabet. The Classics of Western Spirituality Series. Transl. and intro. by Mary E Giles. 1981. Paulist Press, New Jersey. Permission was given by the author to use this article on this website. Julienne McLean practices as a psychologist and Jungian analyst in North London, England. She is also a spiritual director, who has had a lifelong involvement in the Christian contemplative tradition, with a particular interest in the relationship between modern depth psychology and contemplative prayer. She teaches at St Mary’s University College, Strawberry Hill, London and Sarum College, Salisbury, where she is a Visiting Scholar in Christian Spirituality. For many years, she has been teaching, running workshops and study groups throughout the UK, as well as co-leading biannual study retreats in Avila, Spain, on Jungian psychology and Carmelite Spirituality, particularly in relation to the lives and writings of the Spanish saints and mystics, St Teresa of Avila and St John of the Cross. She facilitates, with Viv Stacey, a contemplative spirituality programme in London. As part of the programme, Julienne and Viv have been running ‘Movements in the Soul towards Union’ study groups for many years, which explore the writings of the Spanish mystics, Francisco de Osuna and the ‘Third Spiritual Alphabet’ and St John of the Cross and his great love poem ‘The Spiritual Canticle’. She is the author of ‘Towards Mystical Union’ (St Pauls, 2003), which is a modern spiritual and psychological commentary on St Teresa’s classic text on contemplative prayer ‘The Interior Castle’. She has published many papers over the years, the most recent being ‘The Flowering of Contemplation: the Journey to the Centre of the Soul’ (Mount Carmel, Volume 59/1, Jan-March 2011) and ‘Jung and the Christian Way’ (Vinayasadhana, Vol. 11, No. 1, January 2011). Description of ‘The Interior Castle’ Icon on front cover. The icon is describing, in symbolic terms, the 'interior castle' of our soul, where ‘the secret union, or spiritual marriage, takes place in the innermost centre of the soul, where God Himself must dwell' (Interior Castle, Seventh Mansion, Chapter 2. Above the symbol of the spiritual marriage, and within the castle, a butterfly can be seen — St Teresa used the symbol of the metamorphosis of a silkworm into a butterfly to describe the journey of spiritual transformation. (Interior Castle, Fifth mansion, Chapter 2). A section of the famous prayer of St Teresa is depicted on the scroll in her hand — 'Let nothing trouble you, let nothing frighten you, all is fleeting, God alone is unchanging, Patience obtains everything, Who possesses God wants for nothing, God alone suffices'. In the lower left hand section, the four waters of prayer are depicted, through symbols of how a garden is watered and different ways of drawing water. The early stages of prayer are depicted by either the laborious work of drawing water from the well or the slightly easier method of using a water wheel and buckets. The third and fourth waters, or the interior dwelling places of prayer, are depicted by a stream running through a garden or by 'heavy rain, when the Lord waters it himself, without any labour of ours'. (Autobiography of Teresa of Avila, page 78). The figure in the lower right hand section is St Joseph, towards whom Teresa had a particular devotion, and her signature is depicted across the top of the icon. 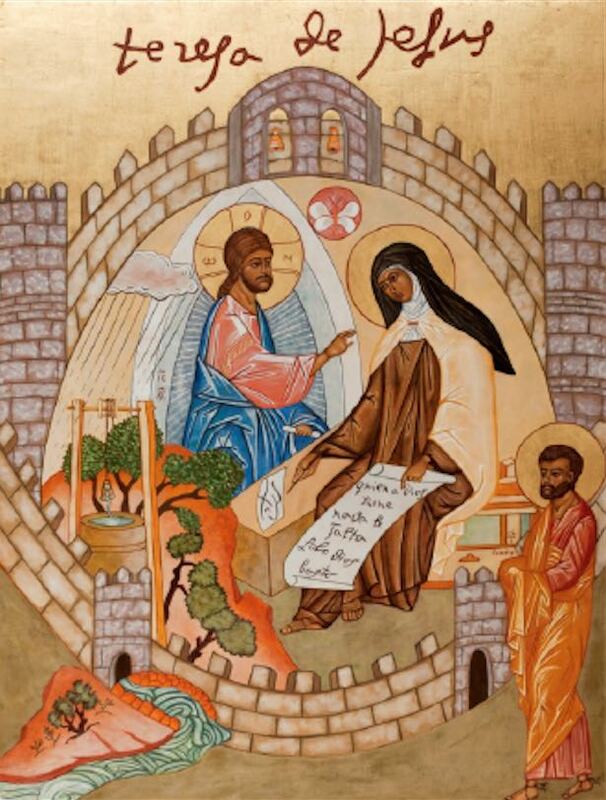 The icon was commissioned by Julienne McLean, and painted by the Melkite sisters from the Monastery of the Annunciation in Nazareth, Israel, in 2005.